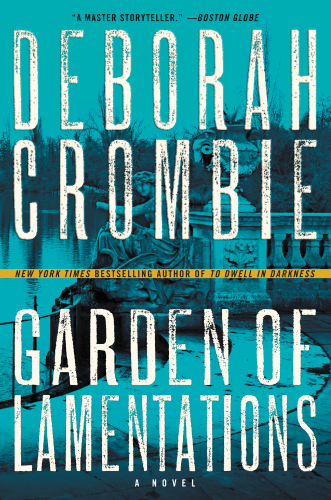 Readers had to wait two years for the latest Deborah Crombie book, GARDEN OF LAMENTATIONS, but it was well worth it. This plot follows the unanswered questions from Crombie’s last novel, DWELL IN DARKNESS. People might remember how Detective Superintendent Duncan Kincaid had not solved the loose ends in the last novel. He is still troubled by a grenade attack, a devastating fire, and the odd behavior of his boss, Chief Superintendent Denis Childs. All the unanswered questions come to a resolution in this story including Kincaid’s investigation of police corruption. But there are also sub-plots that stand on their own. His wife, Detective Inspector Gemma James is investigating the death of a young nanny in the locked Cornwall Gardens, in Notting Hill. These two investigations create an intense mystery, especially since this lack of communication added to the tension in the novel. This novel has plenty of twists and surprises involving the cautionary tale about the abuse of power. It is not only plot driven, but character driven as well where both the relationships and story make for an intense read.